E-19. 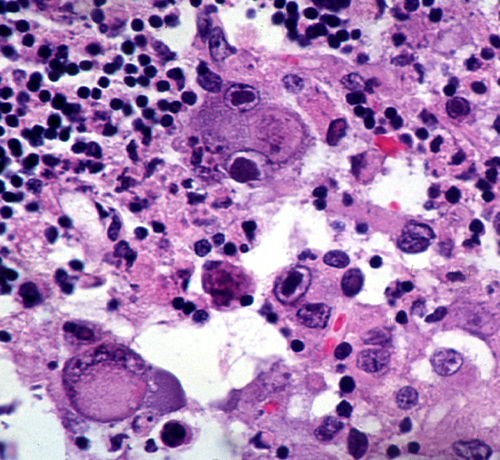 Neonatal HSV encephalitis. Intranuclear inclusion. B-24. 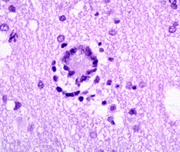 HSV encephalitis. 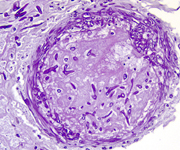 Perivascular mononuclear cells. C-21. 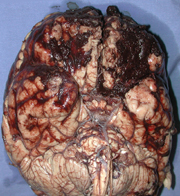 Vascular narrowing post bacterial meningitis. 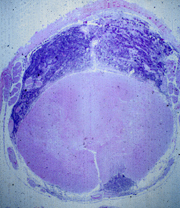 The lesion begins as arteritis due to invasion of leptomeningeal vessels by neutrophils. D-23. 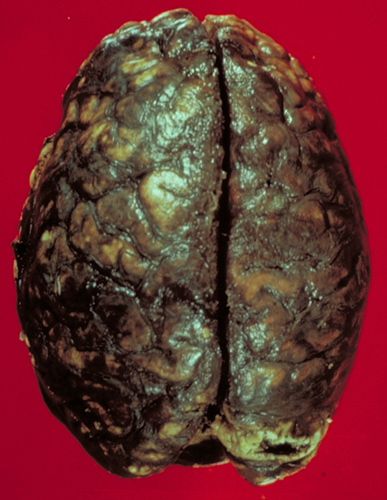 HIV encephalitis. 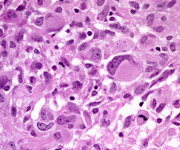 Multinucleated giant cell. A-29. 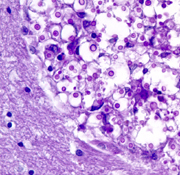 Diffuse low grade astrocytoma of the left basal ganglia and thalamus. A-35. 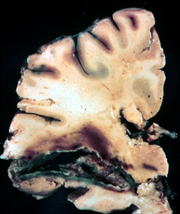 Compression of the left hemisphere by subdural hematoma. B-40. 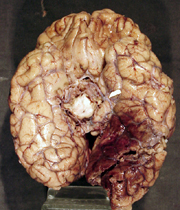 Left temporal lobe herniation, compression of the left posterior cerebral artery, and left temporal-occipital lobe infarct. C-39. 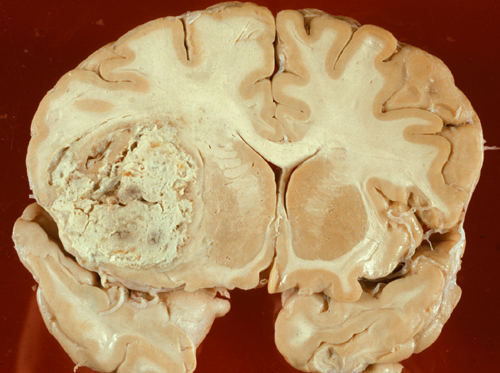 Subarachnoid and intracerebral hemorrhage from a ruptured MCA aneurysm. D-38. 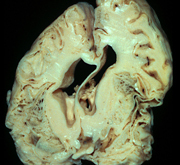 Compression of the left hemisphere from subdural hematoma. E-36. Cerebellar tonsillar herniation with displacement of the fragmented tonsils into the spinal canal. C-41. 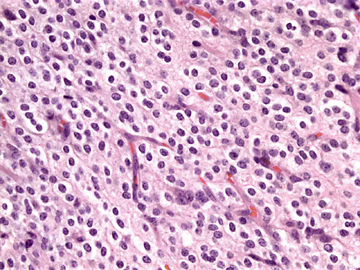 Glioblastoma multiforme; anaplasia and mitoses. D-44. 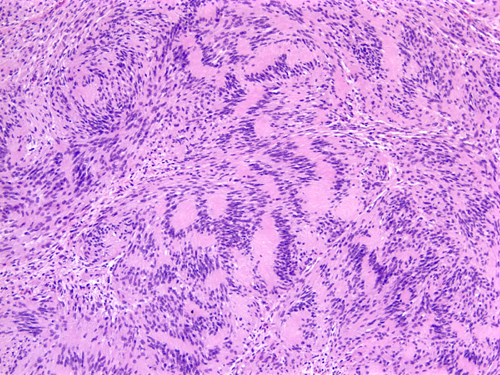 CSF metastases from medulloblastoma. A-47. 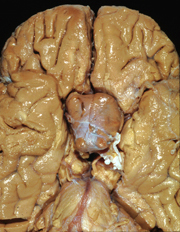 Diffuse axonal injury. 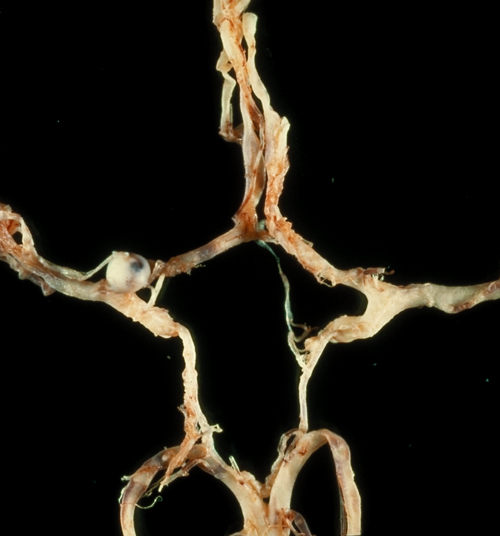 Axonal swellings. 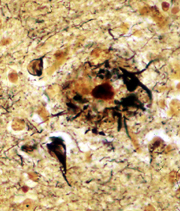 Beta amyloid precursor protein immunostain. C-48. 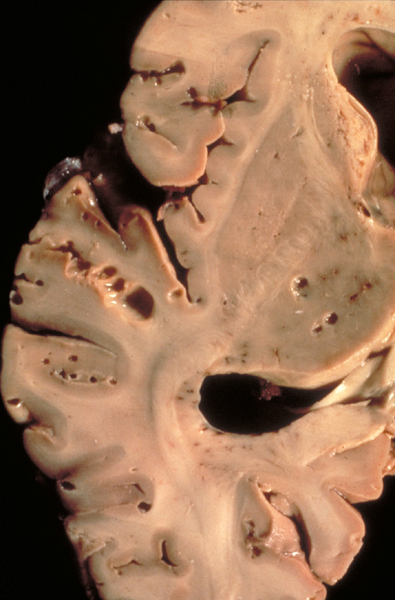 Progressive multifocal leukoencephalopathy. 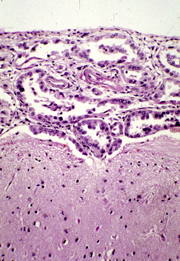 Demyelinated areas. A-55. 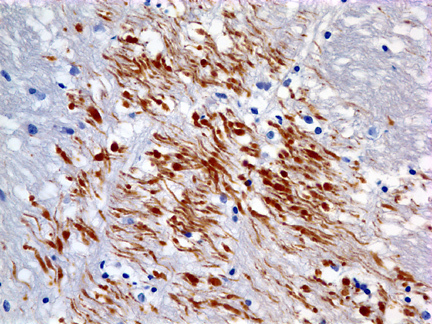 Bilirubin staining of the dentate nuclei of the cerebellum. C-51. 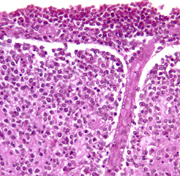 Porencephaly. Schizencephaly is also a correct answer. A-56. 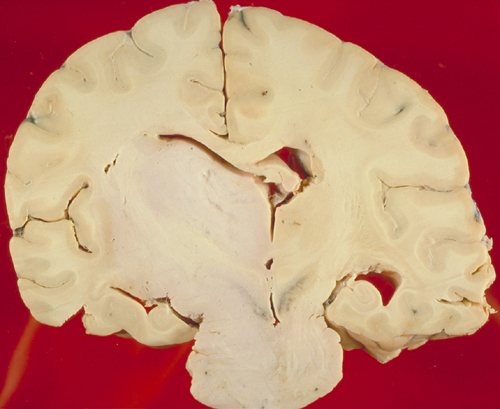 Huntington’s disease. 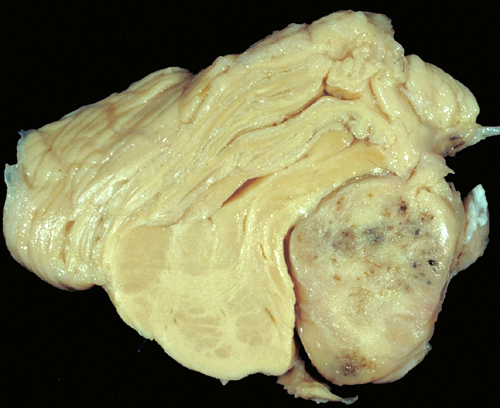 Atrophy of the caudate nuclei. D-60. Parkinson’s disease. 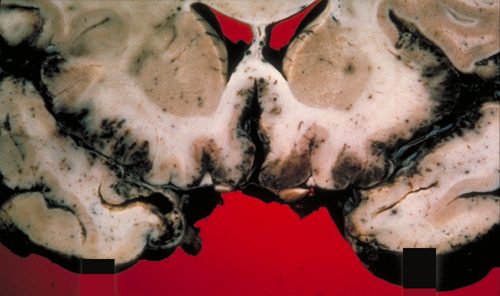 Loss of pigment in the substantia nigra. E-59. Alzheimer’s disease. 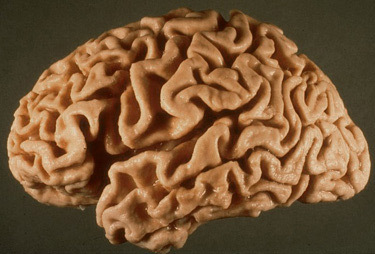 Cortical atrophy. B-63. 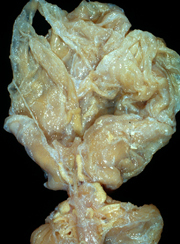 Mucormycosis. 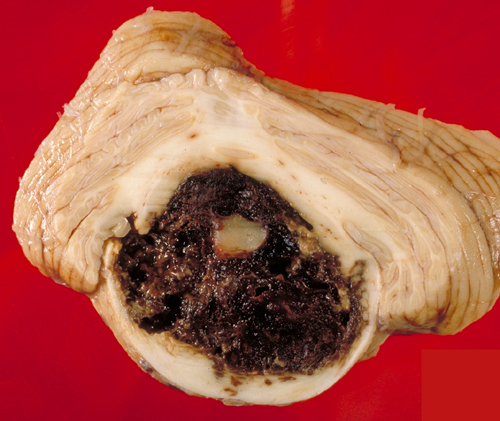 Fungal arteritis. PAS stain. D-62. 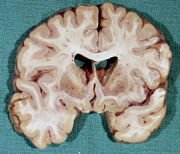 HIV encephalitis. 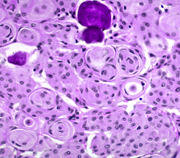 Multinucleated giant cells. A-68. 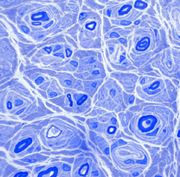 Duchenne muscular dystrophy. Myonecrosis. C-66. GBS. 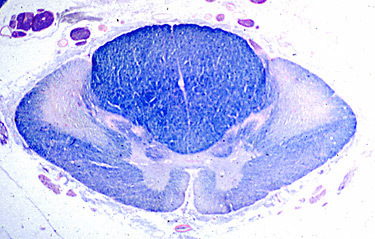 Inflammation in a nerve. D-67. Charcot-Marie-Tooth disease. Hypertrophic changes. E-69. Spinal muscular atrophy. 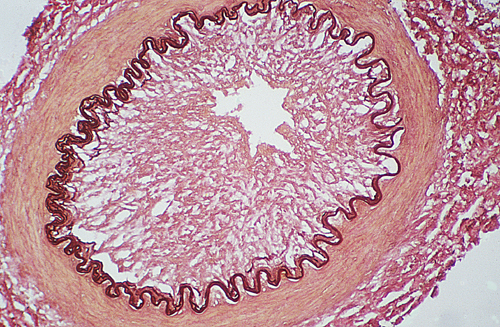 Denervation changes – fiber type grouping. A-73. Alzheimer’s disease. 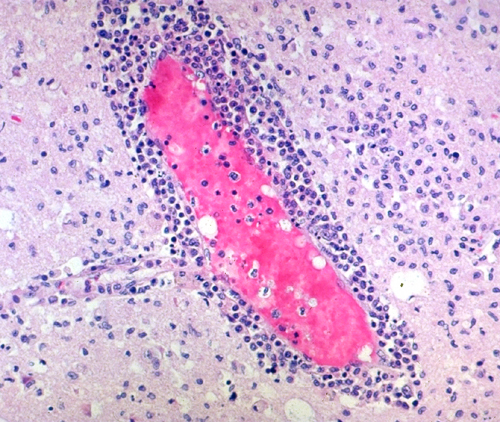 Bielschowsky stain showing plaque and tangle. C-75. 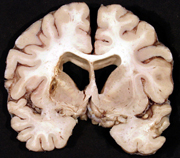 Multiple system atrophy. 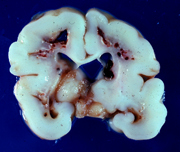 Cerebellar degeneration. E-74. ALS. Degeneration of the corticospinal tracts.